Teacher’s Comments: So much potential wasted. I went to Bald Mountain because I was intrigued by the idea of playing a classic Wilfred Reid golf course. In that, Bald Mountain did not disappoint. It is definitely “old school”: relatively straightforward off the tee, with small, tricky greens. Poor course conditions, very slow play and poor clubhouse management, however, marred the experience. Conditions on the day I played ranged from just okay to very bad. 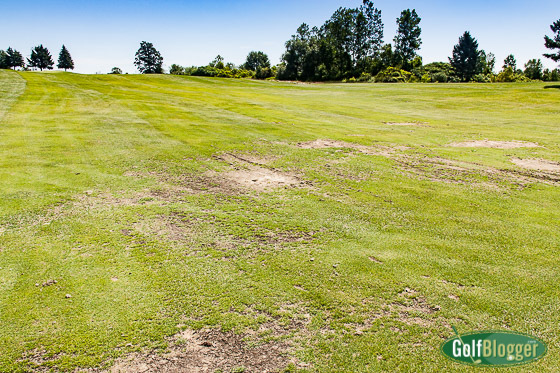 I’m not a guy who minds weeds in the fairway … as long as the weeds cover the dirt. I also don’t mind a few rough edges as long as the fairways and greens are neat. Unfortunately, in many places, Bald Mountain failed even these minimum standards. Bald Mountain didn’t have the worst course conditions I’ve seen this summer, but it was finishing in the money. The slow play was another issue — and one that was caused by the clubhouse. As a single, I expect that I will play a lot of hurry-up-and-wait golf. I can often play a hole in the same amount of time it takes a foursome to tee off (though the offending foursomes should be horribly embarrassed by that). At Bald Mountain, however, the pace of play was excruciating. There were several groups ahead of me playing as though they were on their last legs of life … enormously overweight individuals pushing their bodies out of their carts and then lumbering and wheezing their way to their balls. And not a single ranger in sight. To make matters worse, I discovered at the turn that the clubhouse was sending golfers off the back nine as well as the front. So when I finished the ninth, there were three groups waiting there — two of which had just started their rounds. I think that practice was backing up players all across the course. I nearly walked off at that point. The only thing that kept me from doing so is that all of the groups let me play through. That only made a small difference, though. I ran into another wall of wheezers two holes later. I finally skipped two other holes to get ahead of them, so I could get off the course and end my misery. From the back tees, Bald Mountain stretches 6, 624 yards and plays to a 71.5/121. The other “men’s” tees measure 6,204 and play at a 69.4/117. 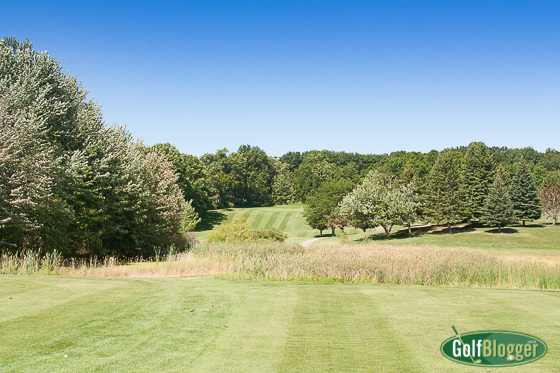 If you can handle the greens, it is not a particularly difficult course. Straight hitters — even if not long — should fare well here. One nice and interesting aspect of the course comes with the elevation changes. Nearly every hole requires some thought about clubbing up or down. 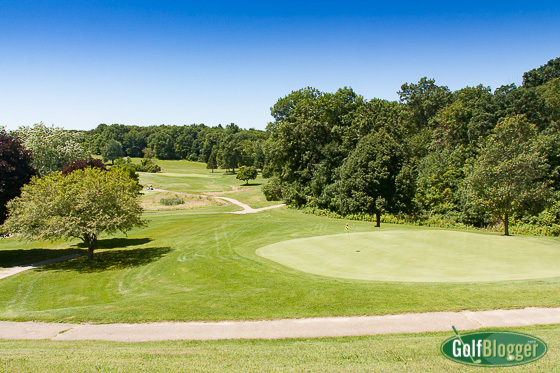 The approach shot on the par 4 third, for example is at least an additional club up to a hilltop green. The par 5 fourth, running parallel, has a nice downhill shot off the tee. Prices at Bald Mountain probably reflect management’s recognition of the course’s faults. I paid $23 to walk and would have paid $35 with a cart. Humorously (although perhaps this foreshadowed later management issues), the woman manning the counter didn’t know what to charge walkers and had to leave her post to go ask someone in the other room. She then proceeded to ring up the wrong amount, and had to clear it and start over. Bald Mountain actually has a lot of potential as a course. If the problems with conditions were cleared up, and traffic managed better, it might be worth a return visit. Got a kick out of the “over weight wheezers”. I live in So. Cal and always play as a walking single. I run into these OWW all the time. Really enjoy your blog. Have you ever played in So. Cal? I’m carrying more pounds than i should, so I shouldn’t begrudge them. But when you look back as you stagger from cart to green and see groups backed up three deep behind you, it’s time to wave them through.